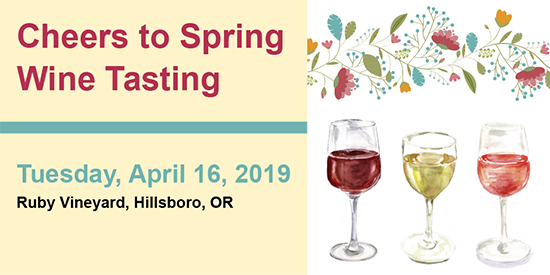 Say goodbye to winter at the OSCPA Cheers to Spring wine tasting. This is the perfect pairing for you to savor spring while meeting up with peers and expanding your network! This is a private wine tasting for OSCPA members and their guest(s) made possible by Ruby Vineyard. *Can't be there right at the beginning? You are welcome to come and go as you please. Register today to join your peers and celebrate spring! If bringing a guest, click "Add Guest." Login (if you haven't already). Add to cart and checkout. If you have successfully registered you will receive a confirmation email within 24 hours. Questions? Contact Heather Hoem; 503-597-5484 / 800-255-1470, ext. 119.